Sorting Thoughts will be ready for your wrist resp. for your Apple Watch with the next update. 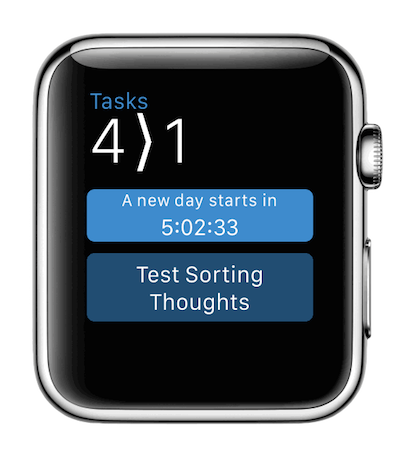 The Apple Watch app of Sorting Thoughts comes with a glance view which shows the number of all open tasks and the number of all tasks which are in progress. Beside you see the most important task name chosen by “end date” and task priority and a counter until the beginning of the next day. With the main app you can see all next tasks of your unlocked thought collections and you can easily change the task state to “Open”, “In progress” or “Closed”. Sorting Thoughts is available for Mac OS X, Windows and iOS.